Nike+ Fuel which is available through the Nike+ app and wearing the Nike Fuelband is an example of a great game, which ensures a large number of customers stay in contact and communicate with the brand. Nike wanted to increase its engagement with customers using their Nike+ running app. Gamification is typically used as part of a marketing campaign or for promotional purposes. Nike however incorporated gamification into its running app Nike + Fuel which enables users to track their physical activity. The game part of the app enables users to compete against each other in their daily amount of physical activity. The app collects personal data from users and keeps a close update on their physical activity, displaying their latest achievements and overall performance. The Nike + app allows users to compare and compete with users from all over the world when connected to social media. The app measures sports performed transcribing them into points, rewarding users for their efforts. Customers are rewarded with trophies and badges after completing different levels. When awards are won, consumers are encouraged to share their results on social media – increasing the brands presence and visibility on platforms. As well as competing against other people, when using the Nike Fuelband users can connect to the especially build Zombies Run! app. 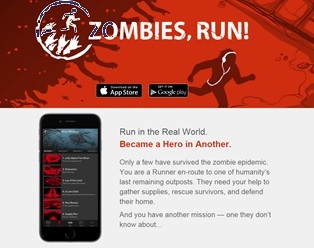 When running using the app, music from your playlist will be interrupted with radio messages about you being chased by zombies, when you hear the warnings you may need to run faster until you have reached the safe zone, or run to pick up the cure for the zombie creating virus. The app makes mundane running more interesting and creates a mission out of an everyday run. As well as running away from Zombies, users can also use the Nike + app to play “tag” against people running near them. The game greatly boosted Nike’s customer loyalty and the system allowed Nike to collect high amounts of data over a long period of time. Nike could then use this data to market their products and services directly. The information led to increased productivity of R&D and digital marketing.